Security Key Board, Board Size: 17" x 23"
Board Size: 17" x 23"
From our wide consignment, we are offering to our patrons an optimum class variety of Acrylic Covered Keyboard. BWI Key Holding Board With Sliding Glass, Board Size: 36" x 48"
Board Size: 36" x 48"
Application: Used Extensively in company , automobile & corporate sector. Material: Made from acrylic with lock. Corner made from ABS & boarder from aluminium extruded section. 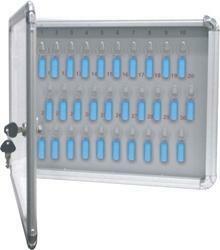 Blue Acrylic Cover Key Hanging Boards, Board Size (inches): 23"x35"
Board Size (Inches): 24" x 36", 23"x35", 24" x 18", 60" x 48", 17" x 23", 12" x 18"
Very convenient lockable key storage system. Different size for 30, 50, 100 Keys. We hold expertise in manufacturing acrylic cover key board, which is used for holding keys. This broad is generally used in hotels to keep the keys in an organized manner. Provided with an acrylic cover, this board can locked for ensuring the safety. We offer this board in different sizes as per the distinct requirements at highly competitive prices. Our company has gained immense experience in the field of presenting Acrylic Covered Key Board.